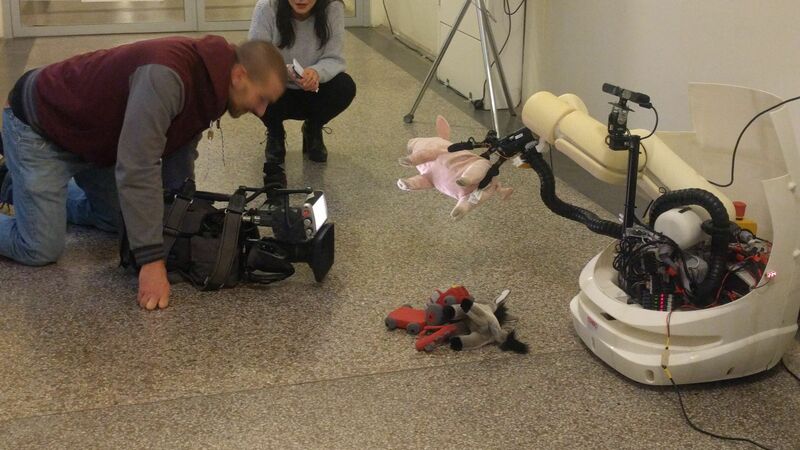 Researchers of the University of Bonn presented a tidying up robot based on SQUIRREL technologies at a kindergarten in Bonn Friesdorf and were filmed by a team of the German public TV station WDR. Professor Maren Bennewitz further explains the research and potential applications in a studio interview at the Lokalzeit Bonn show. March 1st Kenny was tested in a "kids room" in the children secion of an IKEA store in Vienna. IKEA shoppers could throw toys to Kenny and watch it pick them up and drop them in the matching box (animals or cars), and chat with scientists from TU Vienna. Vanessa Evers (University of Twente) gave an interview for the Dutch TV news programme for children (JeugdJournaal) broadcasted by Dutch public service speaking about the Squirrel project and Cristina Zaga showed the Squirrel robot. King's College London lecturers gave a talk on Planning for Autonomous Systems at the AI Congress at O2 for an audience of industry, academia and business representatives. SQUIRREL partners Verein Pädagogische Initiative (VPI) and TU Vienna (TUW) will conduct some short interviews with the parents of the children who participated in the different kindergarten actions that happened during the project. Maren Bennewitz and Philipp Karkowski give a presentation and demonstration about their research in the context of planning for mobile manipulation in a lecture at the community college of the city of Bonn. SQUIRREL mentioned in TV report on Austrian TV station "Servus TV"
TV report "Im Kontext – Die Reportage: SOS Sozialstaat – Ist er noch zu retten?" ("In context - the report: SOS wellware state - can it be saved?") on Austrian national TV "Servus TV" addressed the topic of digitalisation with its potential problems as well as solutions. SQUIRREL robot Kenny was presented within the report. King's College London provided a talk on AI, Robotics and Law to lawyers and businessmen at the Robotiuris Congress on the legal aspects of robotics in Madrid. University of Innbruck will be welcoming interested visitors and students to see their laboratories and research in robotics at November 23rd. 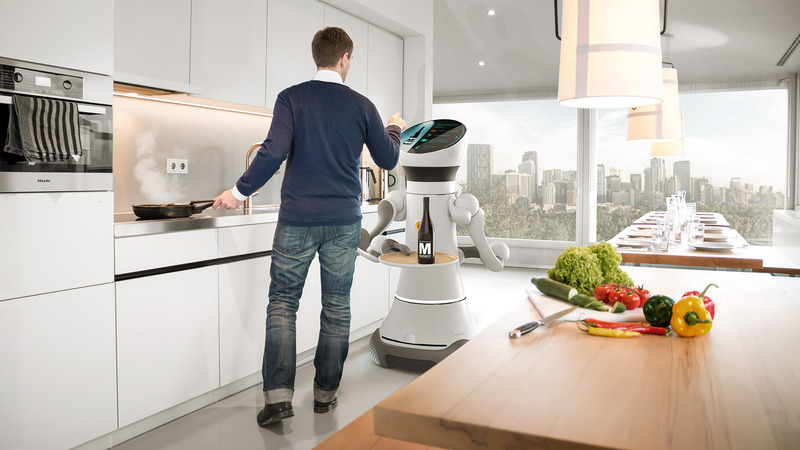 Fraunhofer IPA presented service robot applications and technologies broadcasted in a web seminar by adult education center VHS Böblingen to recipients in Germany and Austria. SQUIRREL mentioned in interview in Austrian national newspaper "Der Standard"
In an interview in Austrian national newspaper "Der Standard" Prof. Sabine Köszegi, head of the Austrian Robotics Council, mentions SQUIRREL robot Kenny and his skills. M. Zillich (TUW) on Austrian FM4 radio broadcast "Auf Laut"
On October 31st Michael Zillich was invited to national Radio station FM4 broadcast "Auf Laut" to discuss the future of robotics together with moderators and robot psychologist Martina Mara. Also listeners could phone in and discuss especially societal changes and the expections and fears - some justified, some unrealistic - going along with this topic. IDMIND exhibited the SQUIRREL robot in the scope of the International Conference on Robot Ethics and Safety Standards (ICRESS) 2017 under the motto "Designing Social Robots-Challenges". King's College London is involved in a panel discussion with TV broadcast on Explainable Planning at the IET Festival of Engineering. 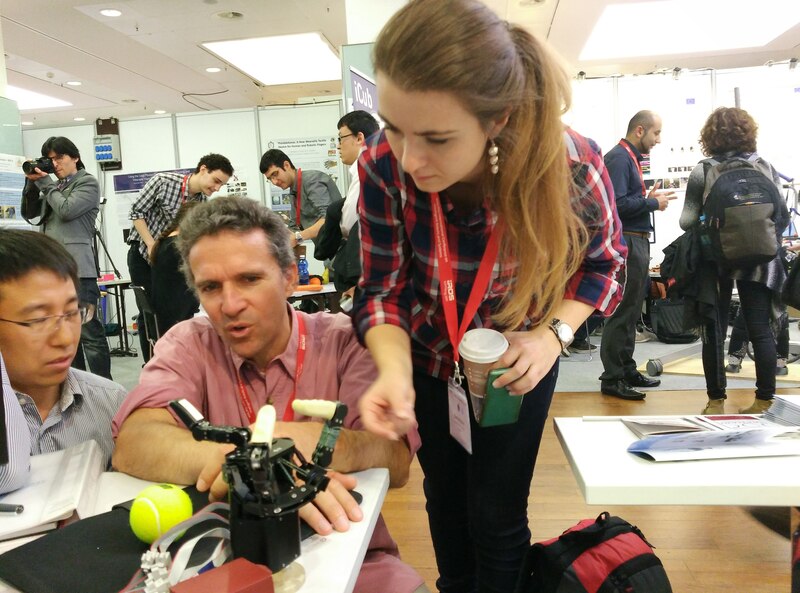 King's College London participated in the IEEE Robotics Open Day for Humanity Showcase and won the prize in the robot competition. 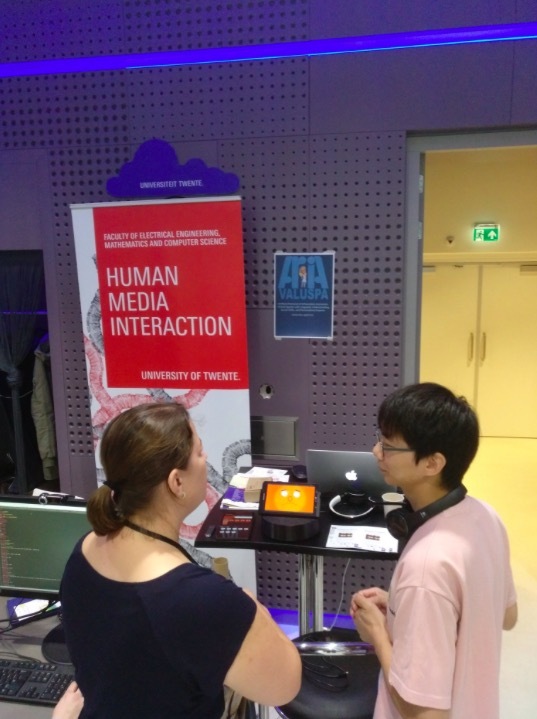 Jaebok Kim (University of Twente) demonstrated speech emotion recognition technology during the lanuage Drongo festival Festival in Utrecht, NL, and collaborated with EU horizon 2020 project Cobotnity. IDMIND participated in the "Challenges faced by autonomous robots in public spaces" exhibition during the European Researchers’ Night (ERN) 2017 at the Pavilion of Knowledge Ciencia Viva, Lisbon, Portugal. The SQUIRREL robot was used to exemplify some of the challenges faced by autonomous robots in public spaces. 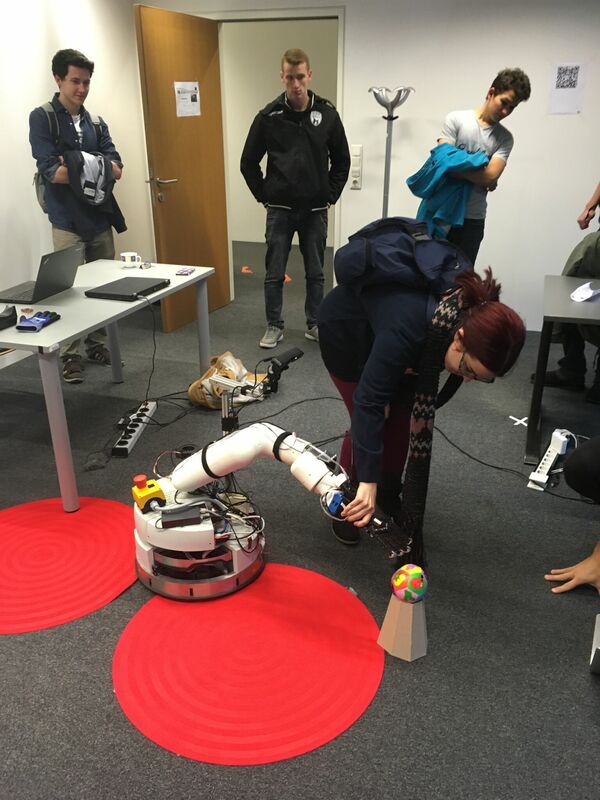 As part of the "Wissenschaftscampus" event Fraunhofer IPA provided an interactive lecture on robots and technologies to high-skilled female students. University of Innbruck invites interested high-school students to visit the robotic labs during the Sommertechnikum MINT event. In the scope of cooperation with Hegel high-school, Stuttgart, Germany, Fraunhofer IPA provided an interactive lecture on robots and technologies to a special class of high-skilled high-school students. Peter Regier presented his vision about robotics to the general public within the lecture series "geeks@cologne"
Peter Regier presented his vision about robotics and his research within the Squirrel project to the general public. A robot doing drama! 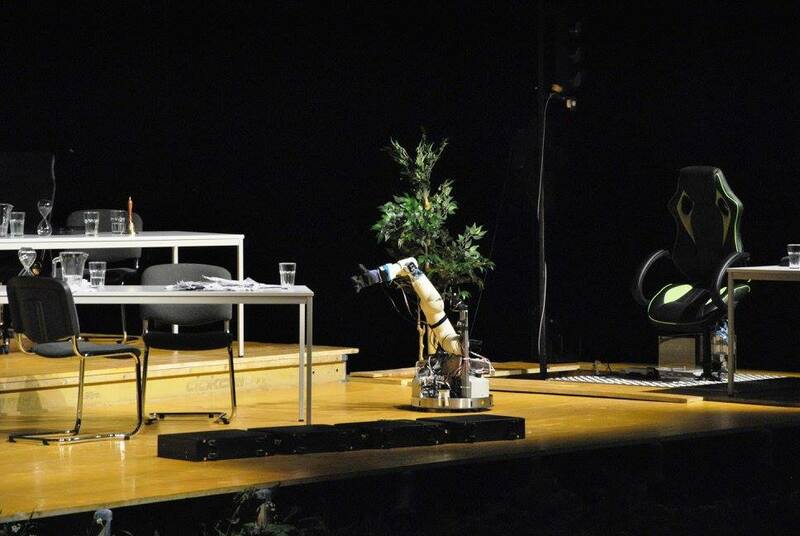 Recently our Robotino had its very first appearance in a futuristic theater play addressing the ever-growing need for more time in our fast-paced world. Clearly, our robot is in no hustle thus being the only one able to take care of a plant it fell in love with. If you're curious about its acting, check out more at: http://www.maerchenfestival.at ! J. Konstantinova from Queen Mary University London was interviewed about tactile sensing developed for SQUIRREL by the daily newspaper Evening Standard. K. Althoefer presented the tactile technologies devloped in SQUIRREL at the Queen Mary University London ARQ–Robotics Taster Day. 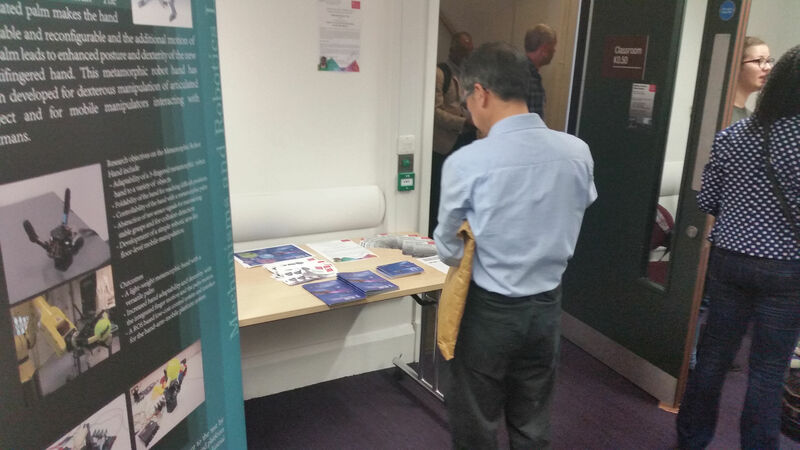 Queen Mary University London exhibited tactile technologies at the UK robotics showcase. 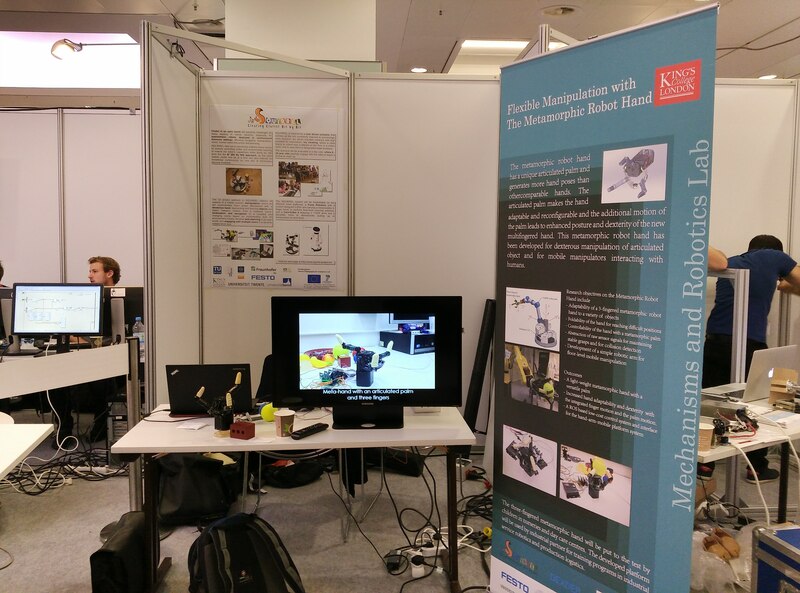 King's College London exhibited the metamorphic hand at the UK robotics showcase which attracted the attention from academia, industry and media. Together with 3 other researchers Khiet Truong engaged in the Research Files series in Pakhuis de Zwijger on a discussion about "Robots - towards everyone's best friend. Are robots socially intelligent, can we already have a robot as a buddy? (Dutch: Robots: van ijskoning naar allemansvriend Deel 2/3. Zijn robots al sociale wezens te noemen? De robot als zorgbuddy, leermeester of kroegmaatje.)". The discussion informed the audience at Pakhuis de Zwijger, Amsterdam, NL, about state of the art of robots and questions like are they already socially intelligent, can we already have a robot as a friend or buddy? Queen Mary University London demonstrated tactile technologies at the ARQ inaugaural event as part of the UK Robotics Week. 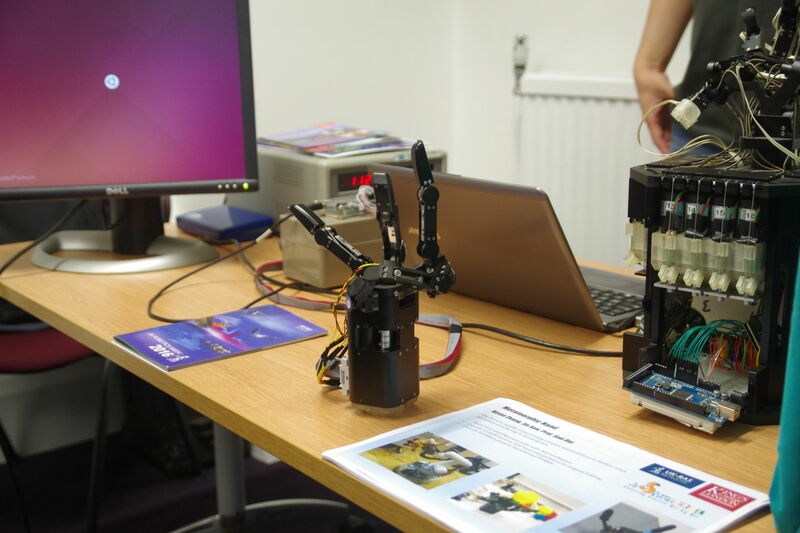 King's College London will exhibit the metamorphic hand to the interested public during the UK Robotics Open Day (June 24th) as an event of the UK robotics week. The borough mayor Ms. von Hietzing of Vienna's 13th borough visited the day care center of VPI and was informed about the SQUIRREL project. 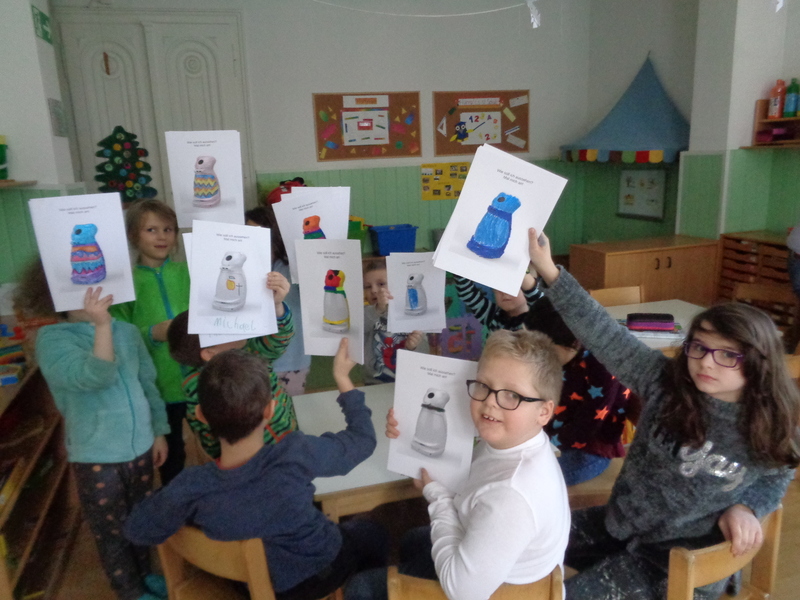 SQUIRREL partner Verein Pädagogische Initiative (VPI) presented the project to the consortium of kindergarten companies in Vienna. Fraunhofer IPA interactively demonstrated various robot platforms and technologies from the robot labs to interested female high-school students. University of Innbruck invites interested high-school students to visit the robotic labs during the 14. Aktionstag Junge Uni event. 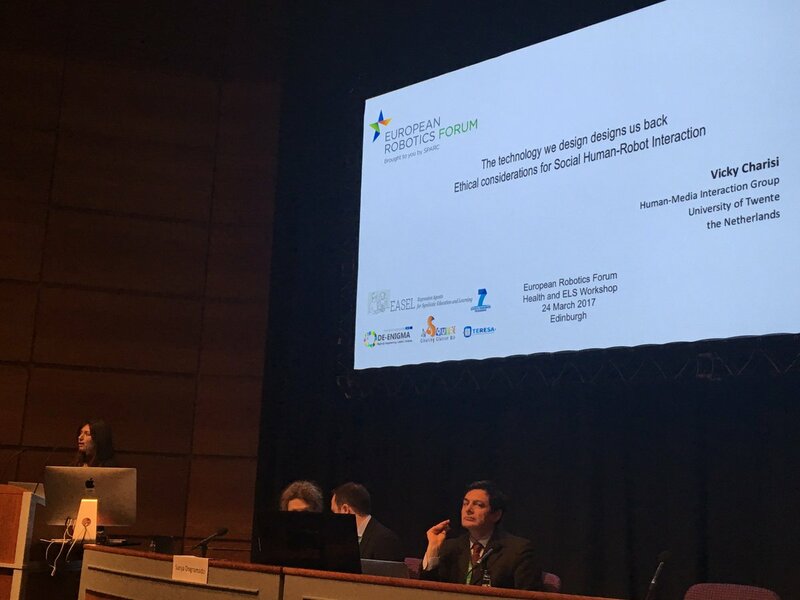 Vicky Charisi gave a keynote talk on "The technology we design designs us back: ethical considerations for social human-robot interaction" at the European Robotics Forum (ERF 2017) Workshop: Ethical, Legal, and Social Aspects of Healthcare Robotics, Edinburgh, 24 March 2107. Daniele Magazzeni (KCL) is the organiser, together with Alberto Finzi, Michael Hofbaur and Andrea Orlandini, of the workshop "Towards Fully Autonomous Robots: Challenges for AI Planning in Robotics", that will be part of the European Robotics Forum (ERF 2017), Edinburgh, 22-24 March 2107. In the scope of the Bosch Girls Campus cooperation Fraunhofer IPA provided an interactive lecture on robots and technologies to three groups of high-skilled female high-school students. Televised Lecture: Can Robots Recognize Emotions in Speech? Khiet Truong (UT) gave a lecture titled "Can robots recognize emotions in speech?" at the TV series Universiteit van Nederland. Who would want a boring robot ...? The children in the nursery at partner VPI tell us how they want Kenny's shell to be painted. 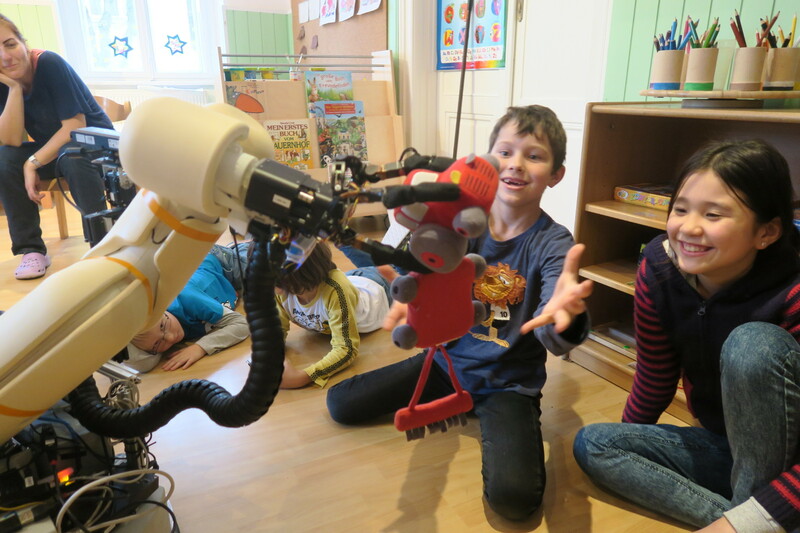 The TV broadcast "Erde an Zukunft" from the public TV channel KiKa has featured a documentary on Care-O-bot 4 and other IPA robots for children. The University of Bonn gives a presentation about robots and the SQUIRREL project, especially on how to teach a robot to tidy up toys, at the Pupils' Day at Clara-Schumann-Gymnasium, Bonn. Malik Ghallab, Nick Hawes, Daniele Magazzeni (KCL), Brian Williams will organize a Dagstuhl Seminar on Planning And Robotics in January 2017. The two-day workshop States of Flux - Soft Robotics in Arts and Engineering was organised by ARQ (Advanced Robotics Centre at Queen Mary University of London) involving artists and scientists from the Universities of Cambridge, Imperial, KCL, QMUL, Surrey and The Royal College of Arts on the newest advancements in soft robotics in arts and engineering. The Proximity Sensor with Color Calibration that was developed within the SQUIRREL project was filed as an initial patent application. Moreover, the Queen Mary University of London business development team (formerly KCL) pesented the novel sensor in China at Jiangsu Centre of International Technology Transfer, at the University in Suzhou, and in an innovation park in Shanghai, organised as exchange workshops. 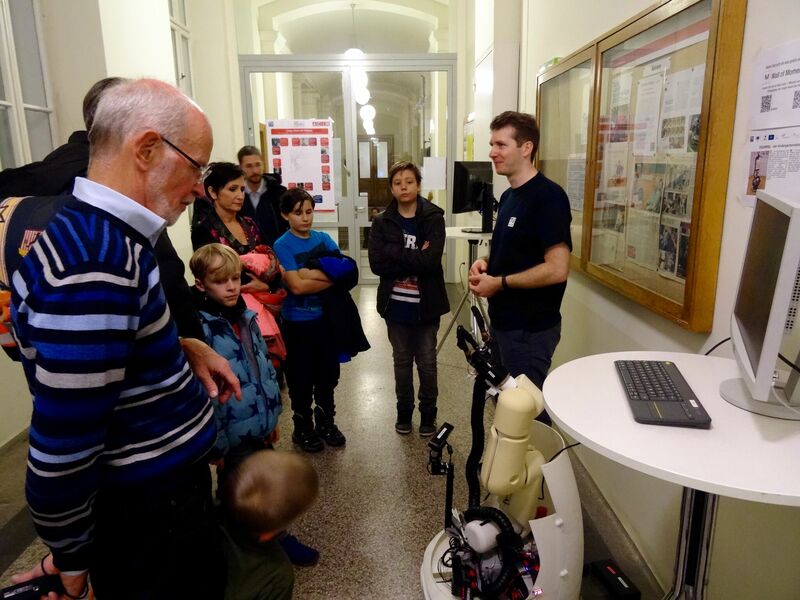 As part of the European Robotics Week, several Austrian Universities host the Long Night of Robots, showcasing cutting-edge research in robotics to the public. 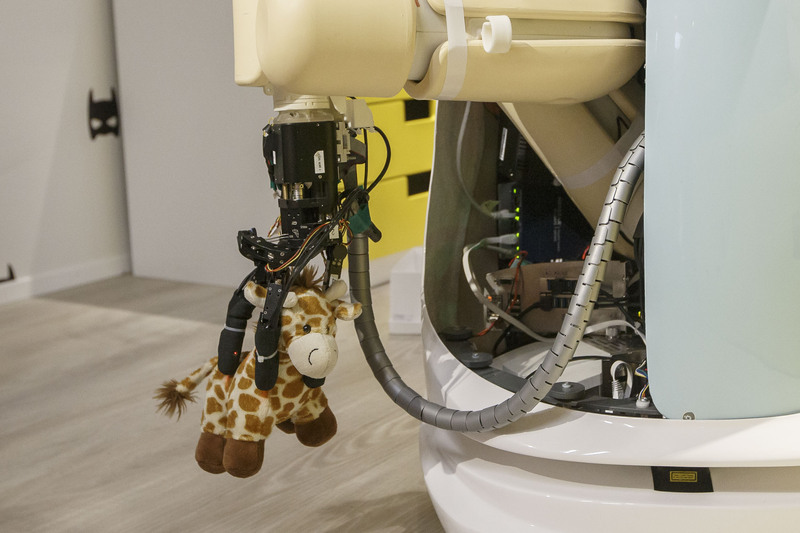 SQUIRREL partners TU Vienna and University of Innsbruck present the SQUIRREL project and explain how robot Kenny can help in cleaning up a children's room. 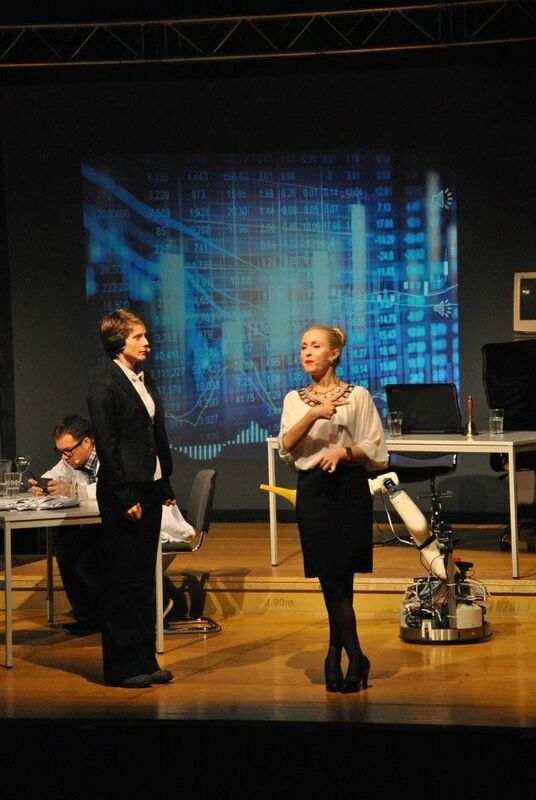 Vanessa Evers gave a talk about robots at the Gala of Science. TUW has recevied and mounted the first part of the shell on Kenny. Still looks prototyp-y, but that can be sanded and painted. 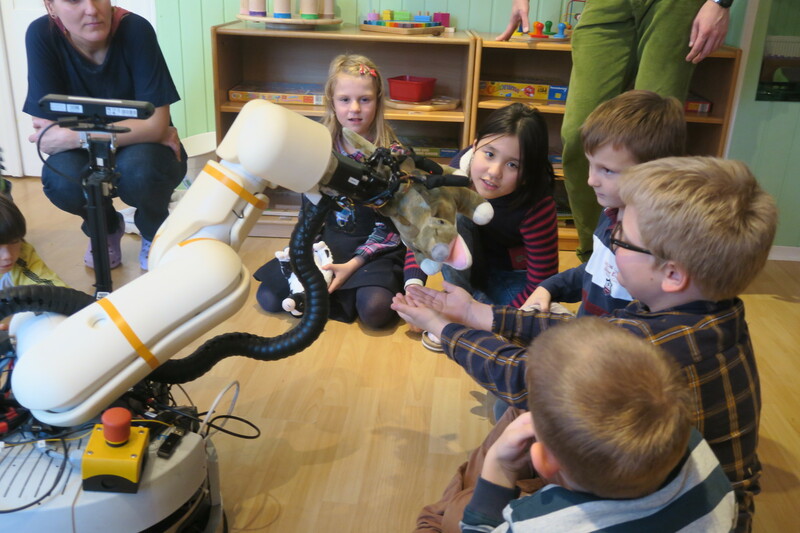 Kenny, the SQUIRREL robot, visited the children in the nursery at partner VPI. Here the children chose toys and laid them out for Kenny to explore the variety of objects Kenny can grasp with its arm and 3-finger hand. Not each attempt was successful at first try, but with help from the children almost all objects could be picked up in the end. UNI Global Union features a video on Vanessa Evers (UT) talking about robots and AI. Prof. Jian S. Dai will give a distinguished lecture at the Great Hall of King's College London. This lecture will provide an overview of innovative robotics that is shaped by the arts. Professor Jian S.Dai will be presenting robots of the future that are moulded by innovation and artistic imagination. The talk will also explore the latest developments in Origami robots, metamorphic hands, and metamorphic parallel robots with their domestic, health and industrial applications. Vicky Charisi gave an invited lecture to over 300 students from the Department of Informatics, University of Amsterdam. 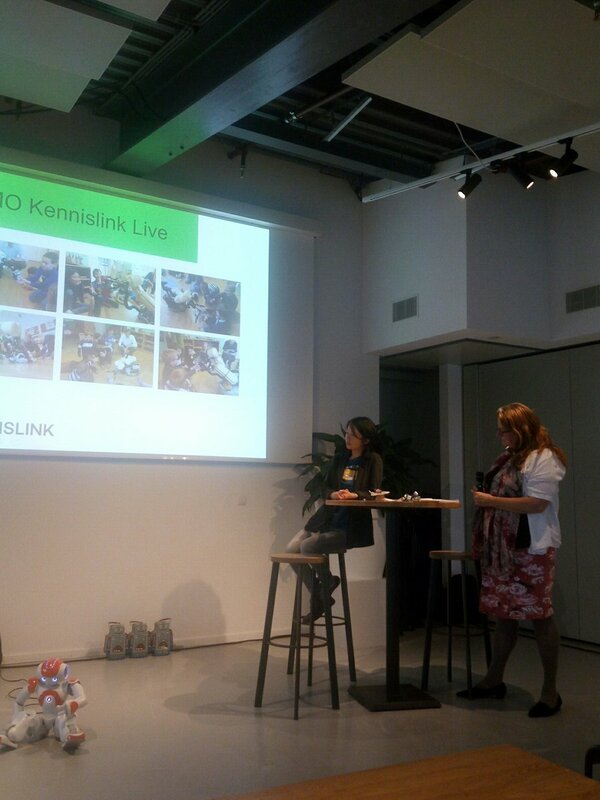 Vanessa Evers gave a lecture on television about social robots within the series of Universiteit van Nederland. Vanessa Evers (UT) talks about the Netherlands in 2050 and robotics in 2050 at the TV show Zapp for Dutch kids. 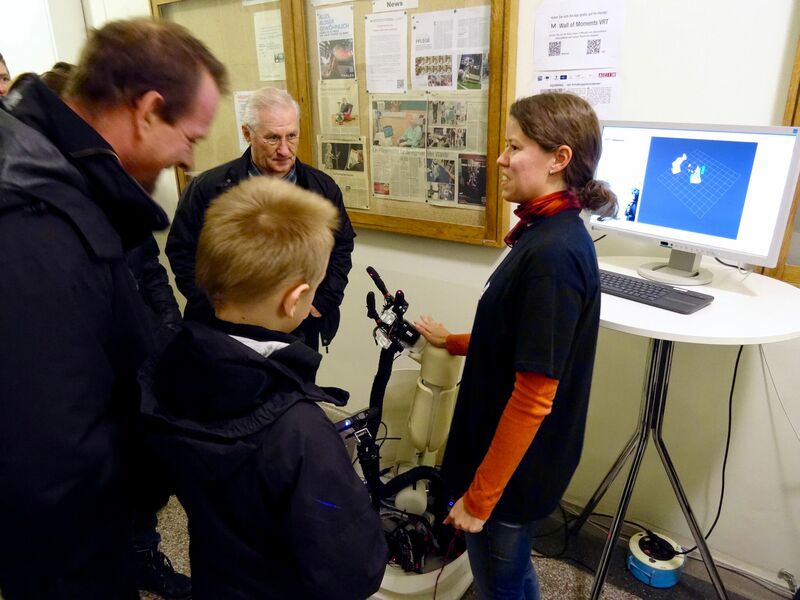 TU Vienna has showcased the SQUIRREL project at the University Meets Public event organized by adult education center VHS Vienna. Cristina Zaga and Vanessa Evers were involved in presentations and discussions at the yearly event Nacht Van Wetenshap en Maatschapij, the grand gala of research in the NL. Jaebok Kim and Khiet Truong (University of Twente) demonstrated speech emotion detection technology during the lanuage festival Drongo Festival in Utrecht, NL. 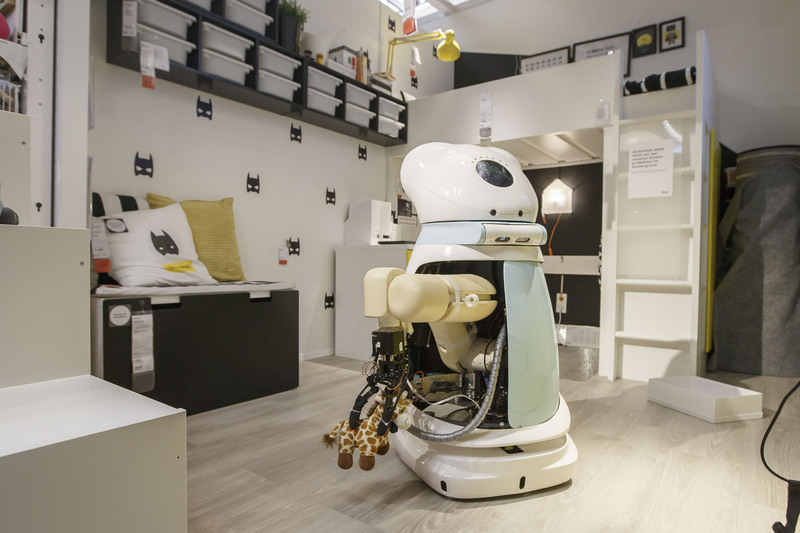 The online magazine Sigma published an article about: Robots will make our lives easier. Daniele Magazzeni from KCL features the tutorial "Planning for Hybrid Systems" at the European Conference on Artificial Intelligence 2016 in The Hague. Kenny, the SQUIRREL robot, is featured in an online article of the German Newpaper "Die Welt" on robots in everyday life. The online magazine AGCONNECT interviewed Vanessa Evers and published the article Robot Love: about human-machine interaction. Social Intelligence is crucial for robots. Vicky Charisi and Cristina Zaga organized a Child-Robot Interaction Workshop with children and teachers at the Design Lab (UT). 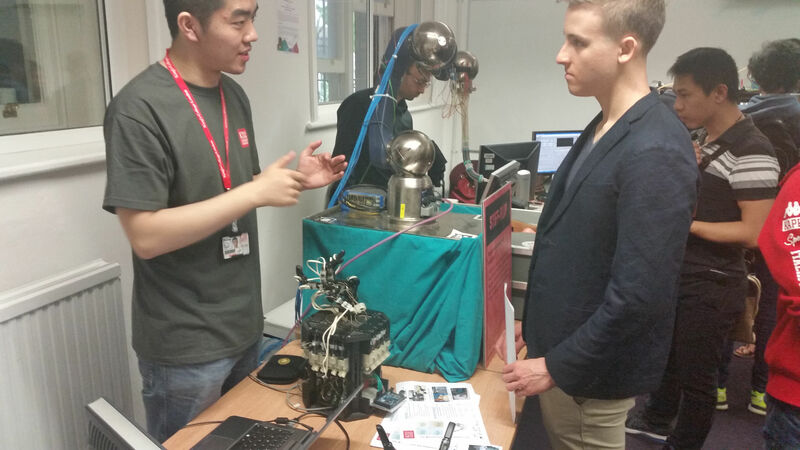 The KCL Centre for Robotics Research has presented the SQUIRREL project as part of their open day event. The event was supported by UK-RAS society, and was part of the first UK robotics week. Invited interested researchers from the UK robotics community, as well as general public - school groups and people interested in robotics - could learn about the developments within the project. Vanessa Evers gave a talk about changes in society with robots at ProDemos café. Michael Cashmore from KCL provides a tutorial on ROSPlan at the ICAPS 2016 Summer School in London. The Austrian TV and radio station ORF featured TV report (ORF Ö1 Wissen Aktuell) and a radio report (ORF 2 Tirol Heute) on child-like robot learning at the University of Innsbruck. The radio report is available from (in German): http://oe1.orf.at/programm/434380. The magazine News reported on the SQUIRREL project. The article can be viewed here (in German): https://iis.uibk.ac.at/_media/public/16042016news_zech_lnf_full.pdf. In a cafe-style setting, Vanessa Evers will give a presentation about her research on social robotics. Vanessa Evers from University of Twente receives the Dutch Royal Society of Engineers Award because of the appealing way in which she manages to make the connection between science and society. Maren Bennewitz presents her research and in particular the Squirrel Project at the Kärcher Future Day. The SQUIRREL / 3rdHand Winter School on Manipulation in Clutter took place 29.2. - 4.3.2016 in Obergurgl, Austria. 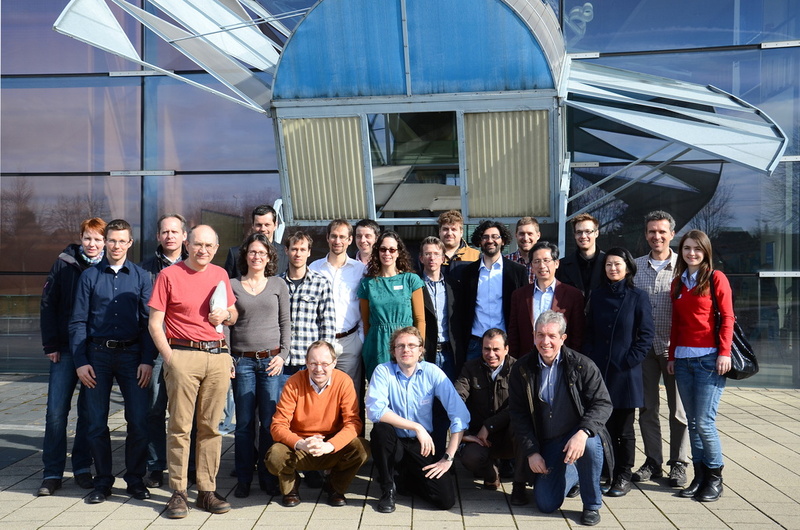 This second SQUIRREL school was jointly organised with the team from the 3rdHand project (http://3rdhandrobot.eu). 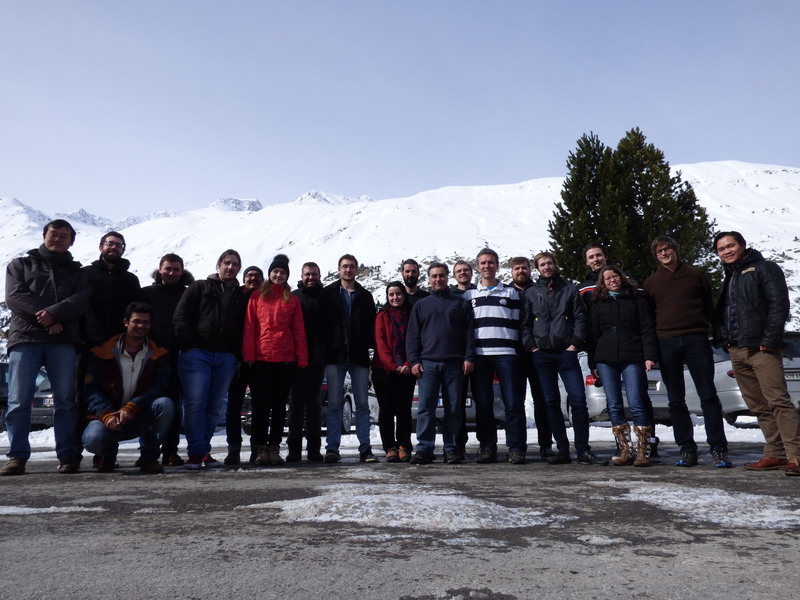 20 participants convened in the winter resort of Obergurl in Tirol, listening to a range of interesting talks from five lecturers: Robert Platt (Northeastern University), Giampiero Salvi (KTH), Manuel Lopes (INRIA), Peter Roth (Austrian Institute of Technology), Yasemin Bekiroglu (University of Birmingham). 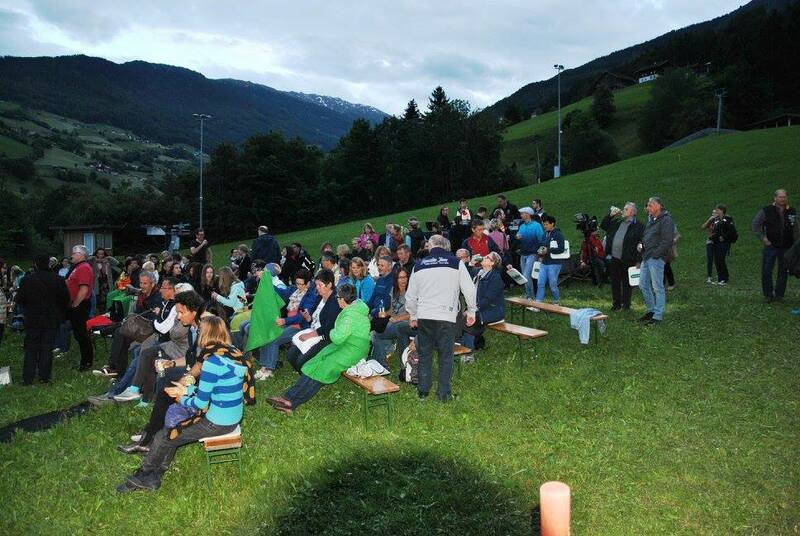 Next to talks and lively discussions, participants enjoyed the lovely winter landscape, hiking and skiing. Daniele Magazzeni (KCL), Scott Sanner, Sylvie Thiebaux will organize the AAAI workshop on Planning for Hybrid Systems in Phoenix. Justus Piater from the University of Innsbruck has provided a public interview about potential for exploitation of ICT research at the Technology Transfer Center of Western Austria (WTZ West). Researchers from the University of Innsbruck will be providing a contributed talk on grasp affordance learning, another contributed talk on non-prehensile pushing, as well as a tutorial on grasping and manipulation at the GMAR winter school in Graz. Vanessa Evers presented her research and ideas at the World Economic Forum in Davos. Videos can be seen here https://www.youtube.com/watch?v=KvgH-p6-Dt0 (The rise of social robotics, ~5min) and here https://www.youtube.com/watch?v=YV4fTOSpUxs (Issue Briefing: Infusing Emotional Intelligence into AI, ~40min). Justus Piater is an invited speaker at the 1st International Workshop on Recovering 6D Object Pose, at ICCV in December 2015. The TGM, one of the top HTL (Höhere Technische Bundeslehranstalt) in Vienna, in cooperation with the Practical Robotics Institute Austria (PRIA), organises the Lange Nacht der Technik (Long Night of Technology) to bring scientists in direct contact with students. The event invites visitors of all ages to learn about teaching and research at the TGM, presenting research projects by TGM students, invited scientific talks, and offering workshops from biotechnology to robotics. Furthermore Universities and companies present latest research projects. SQUIRREL will be present with the Robotino and demonstrates controlling a mobile robot with gestures. 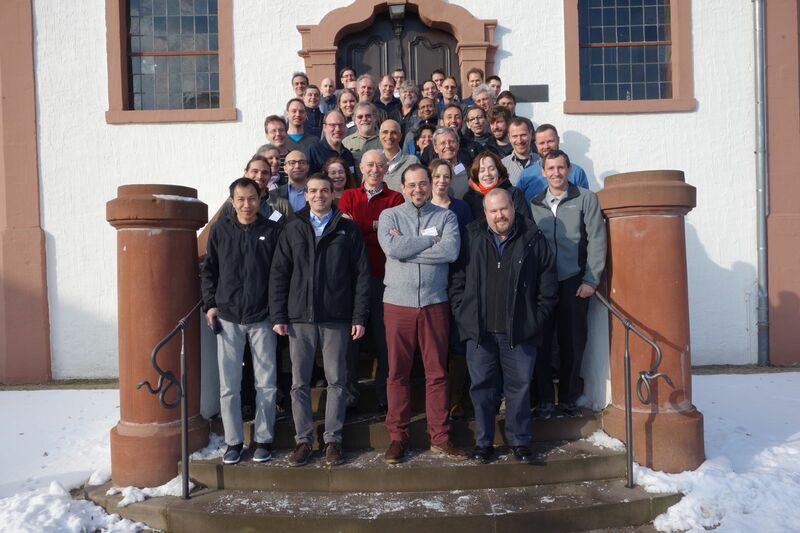 Justus Piater (UIBK) organizes Dagstuhl Seminar 15411 on Multimodal Manipulation Under Uncertainty. 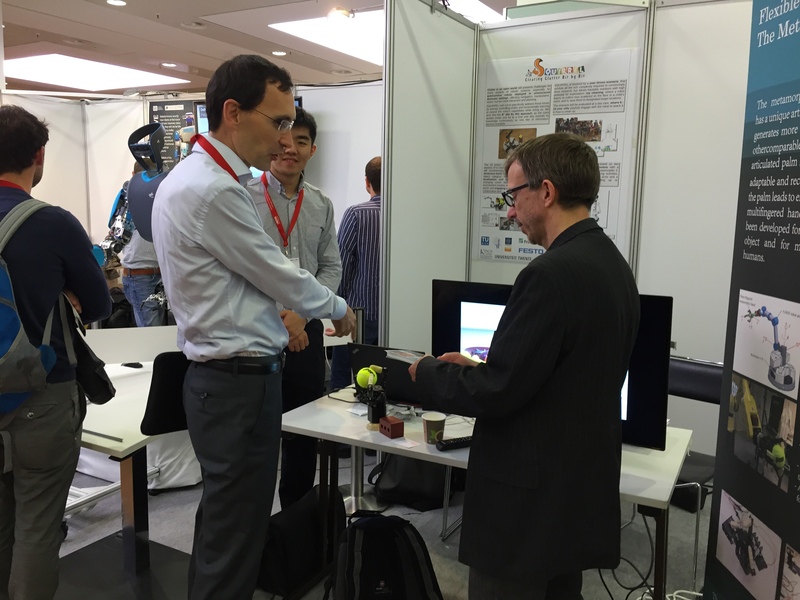 The SQUIRREL project proudly announces to feature an information booth at IROS 2015 in Hamburg. Visitors will be able to get in contact with the project people, watch current videos on the project, and see a demonstration of the metamorphic hand developed within SQUIRREL. Justus Piater is an invited speaker at the workshop on Learning Object Affordances: A fundamental step to allow prediction, planning and tool use in autonomous robots, at IROS in September 2015. SQUIRREL appeared in the TV documentary series "Newton" on ORF (Austrian national TV), about robotics and AI, on Sept 19. 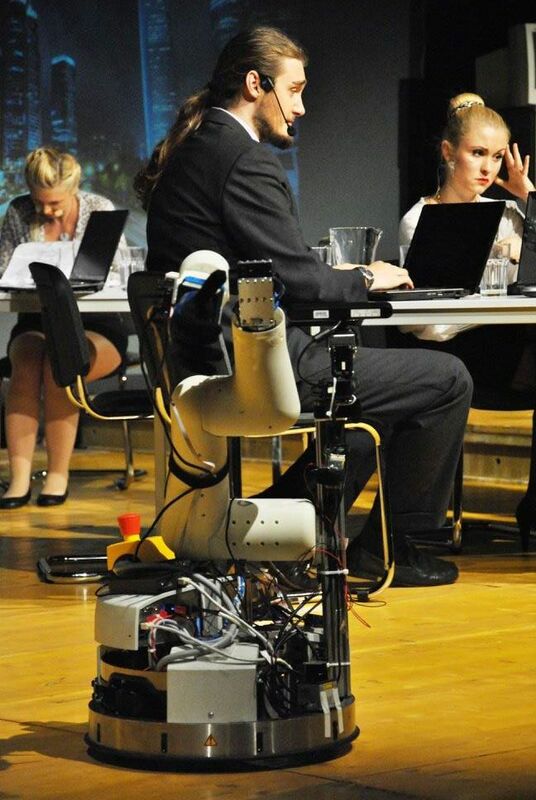 Justus Piater is an invited speaker at the workshop on Robot Learning, Bottom-up and top-down development of robot skills at ICAR in July 2015. Justus Piater is organizing, with Tamim Asfour (KIT), the workshop on Learning Reusable Concepts in Robotics at RSS in July 2015. Justus Piater is an invited speaker at the workshop on Robotic Hands, Grasping, and Manipulation May 30, 2015, at ICRA 2015 in Seattle. SQUIRREL appeared in the weekend edition of Die Presse, one of the major Austrian newspapers. Vanessa Evers was interviewed by a major Dutch newspaper NRC about social robots and the Squirrel project, see link (in Dutch). A news item on the SQUIRREL project and Care-O-bot 4 was published in the Stuttgarter Zeitung newspaper. The SQUIRREL project was thematized in the humorous column "Schlusslicht" at the website of Germany's premier public TV station ARD. Michael Zillich was interviewed about SQUIRREL by German radio station radioeins.de. The SQUIRREL project and its technical ambitions have been published in the Salzburger Nachrichten, a major Austrian newspaper. The SQUIRREL project and its technical ambitions have been published at golem.de, a popular webpage on latest technology news. An online article about the SQUIRREL project and its technical ambitions has been posted at computerwelt.at. An online article about the SQUIRREL project and its technical ambitions has been posted at TU Wien News. The newspaper Badische Zeitung has featured an article about the SQUIRREL project. 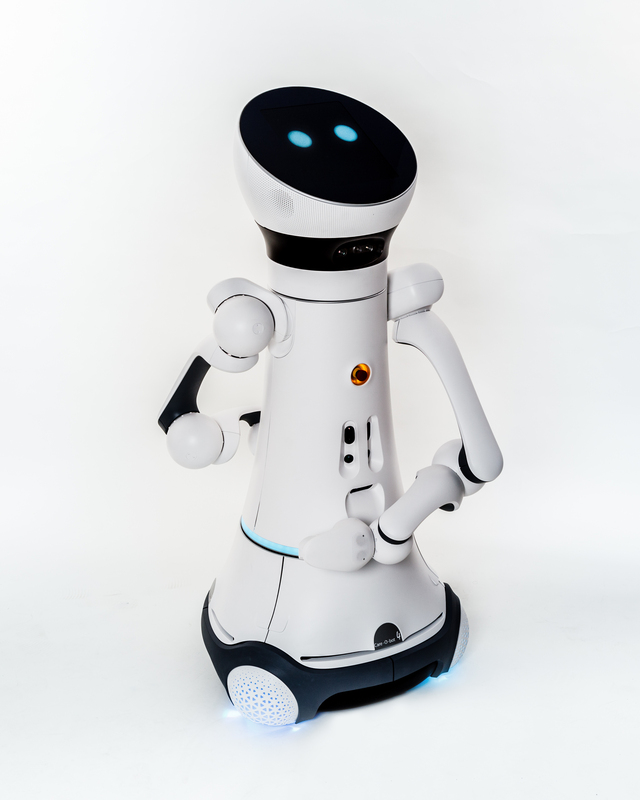 Care-O-bot® is the product vision of a mobile robot assistant to actively support humans in domestic environments. The meanwhile fourth generation of this successful development series is more agile and modular than its predecessors and offers various ways of interaction. The enhanced agility of Care-O-bot 4 is owed to the patented spherical joints around discreet pivot points on its neck and hips. They extend the robot's working space and allow 360 degree rotations of head and torso. Previous investigations have shown that social ways of interaction are essential for the acceptance of interactive service robots. As with previous generations, social role models were used as a guiding vision in developing the design and functionality. Using the display integrated in its head and based on the current situation, Care-O-bot 4 is able to display different atmospheres. While the concept for the Care-O-bot 3 was a more reserved, cautious butler, its successor is as courteous, friendly, and affable as a gentleman. 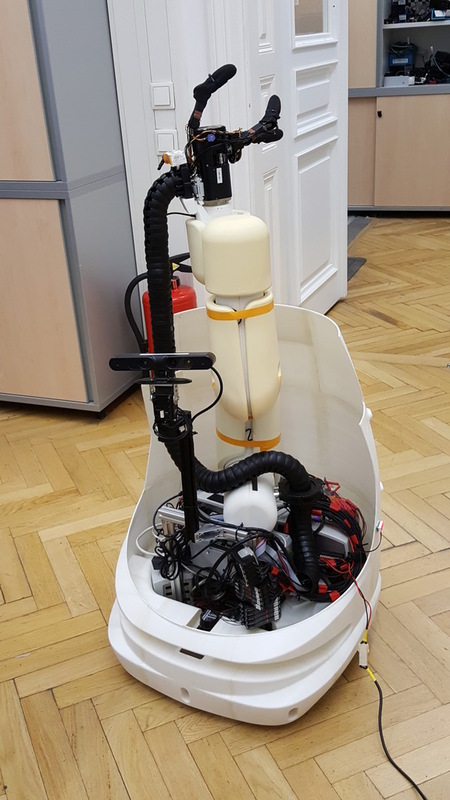 Within SQUIRREL we will port the intermediate results from the scientific work packages to our second demonstrator platform Care-O-bot 4 in order to assess reusability of the developed components. The Intelligent and Interactive Systems (IIS) group from UIBK will participate in the "Junge Uni Aktionstag 2014" ("Young University Open Day 2014") on November 7th, 2014 together with other research groups from this university. 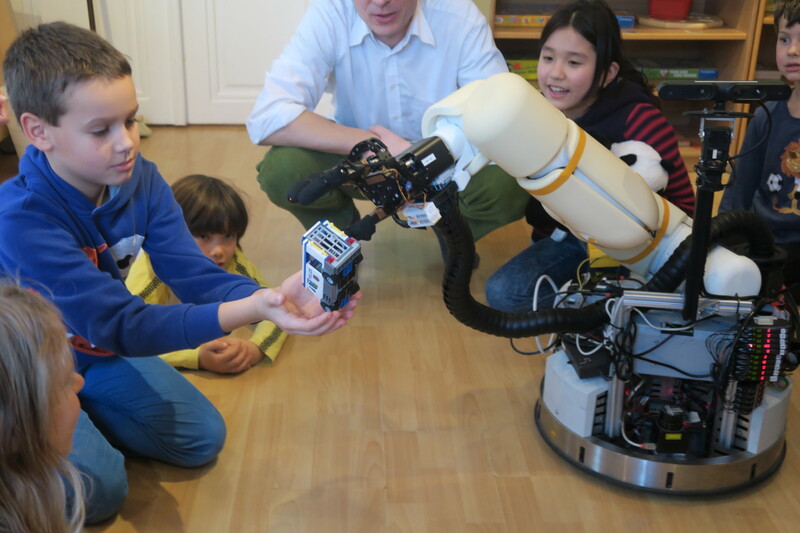 IIS will present the SQUIRREL Robotino robot to pupils from Innsbruck. The initiative "Junge Uni" wants to awake joy of science and research in children and adolescents. Seven to sixteen year olds will have the opportunity to see some small tasks and to interact playfully with the robot. The workshop will focus on vision related problems and applications of affordances, the visual primitives grounded in the "functionality" of objects. We extend you a warm invitation to attend and participate at the workshop. Further details can be found at http://affordances.info/workshops/ECCV.html. 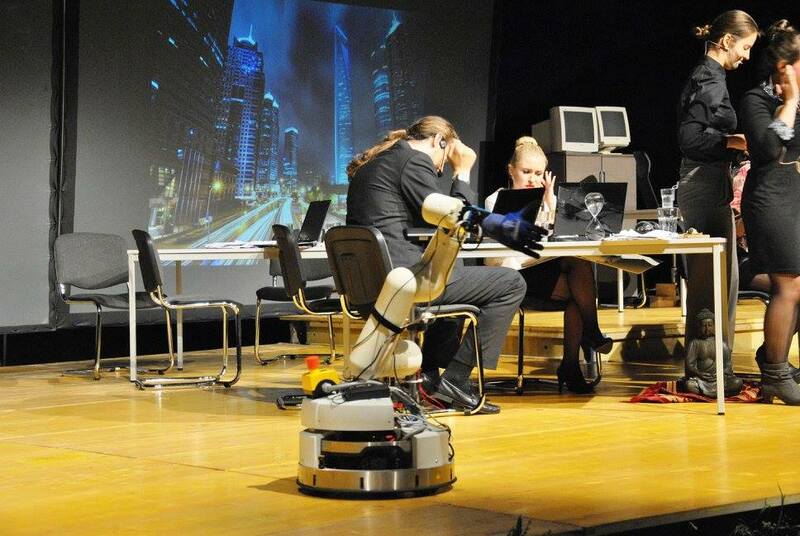 We are organising the 3rd Workshop on Robots in Clutter in conjunction with IROS 2014 in Chicago. Deadline for submission of papers and extended abstracts is July 25th (extended!). Check the webpage http://workshops.acin.tuwien.ac.at/clutter2014 for more details. This year's summer school feataures excellent invited lectures: Tamim Asfour, KIT; Tom Duckett, Univ. of Lincoln; Cyrill Stachniss, Univ. of Freiburg (now Bonn); and Paul Furgale, ETHZ). Guided by an initial workshop on software integration participants will then put their knowledge to use in hands-on work on our Robotino robots to solve an actual simplified clean-up task. 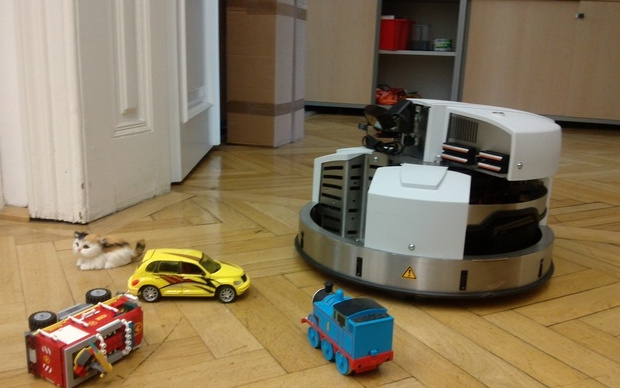 June 2014: The robots arrived! FUNDINGThis project is funded by the European Community's Seventh Framework Programme under grant agreement No 610532.